PR and Communications are being forced to modernise. Increasingly there is a requirement for companies to understand the balance between narrative, content, SEO and traditional PR techniques. Companies also need to consider how they are managing and improving their digital influence and authority. To do all this you are no longer able to game the system. The language of digital and data is something that many people have only scratched the surface of but need to get to grips with if they want to survive. "What use is any PR or comms campaign if it can not be effectively measured and improved upon?" When planning your content calendar there are several digital metrics you should be using. These include things like keyword search rankings, social mentions, engagement in terms of likes and shares (not only views), or the growth and quality of your social networks and channels. You also need to identify where your content sits within your content types and content framework. If you want people to stay longer on your content and like and share it while they are there (boosting both your search and seeding functions) then video wins as a content format every time. It can be used to shape your brand, drive revenue and get your story out there. With LinkedIn Marketing you can land your content right onto the laps of the people you want to talk to. The key is in understanding how to approach it strategically before you even turn on a camera or computer. 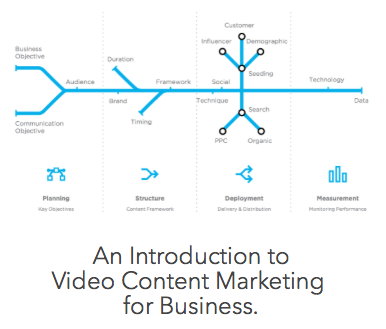 To outline this strategy approach we have created a guide: "An introduction to video content marketing for your business".